Sound nursing clinical judgment is at the core of competent and safe client care. New graduate nurses face increasing challenges that underscore the importance of investigating how nurse educators teach and measure nursing students' abilities to make clinical judgments. This article presents the National Council of State Boards of Nursing-Clinical Judgment Model (NCSBN-CJM) and discusses the use of the model. A multidisciplinary team conducted a qualitative comparative analysis of the relationships between the NCSBN-CJM and the three leading frameworks for providing clinical judgment education to entry-level nurses. The NCSBN-CJM aligns with the Information-Processing Model and the Intuitive-Humanistic Model. The NCSBN-CJM also can be used to assess the Dual Process Reasoning Theory. Sound nursing clinical judgment is at the core of competent and safe client care. New graduate nurses face increasing challenges including staffing shortages and more acutely ill clients. These challenges underscore the importance of investigating how nurse educators teach and measure nursing students' abilities to make clinical judgments on behalf of clients (Institute of Medicine, 2010). Nurses agree that clinical judgment is a higher order construct that is difficult to define (Muntean, 2012) and that a valid and reliable method for measuring clinical reasoning by health care educators and providers is lacking (Rencic, Trowbridge, Fagan, Szauter, & Durning, 2017). This lack of a quality assessment method in health care creates difficulties in determining the development of clinical judgment, as well as measuring clinical judgments essential for public safety. This article presents a model for assessing the ability of nursing students to provide sound clinical judgments and discusses the use of the assessment model within the predominant nursing theoretical frameworks. It is well known that new graduate nurses are challenged by the multilayered, ill-defined issues present in a range of care settings (Benner, 1984; Lasater, Nielsen, Stock, & Ostrogorsky, 2015). Studies have shown that in the first years of practice, new graduate nurses do not make clinical judgments at the same level as more experienced nurses (Kavanaugh & Szweda, 2017). In fact, it can take several years before new nurses can function at a high level when making quality clinical judgments (Lasater et al., 2015). One implication of this is that less-experienced nurses may need support for a longer period of time. Another implication is that academic nursing education needs to focus more on the development of students' clinical judgment before graduation. Either way, an effective system of evaluating nursing clinical judgment is essential across the education and practice spectrums to ensure competent and safe practitioners. Although a universal definition of nursing clinical judgment has been elusive, three established and accepted paradigms for nursing clinical judgment include the Intuitive-Humanistic Model (Benner, 1984), which was later integrated into the Tanner Model (2006); Dual Process Reasoning Theory (Croskerry, 2009; Pelaccia, Tardif, Triby, & Charlin, 2011), anchored in the cognitive continuum theory (Harbison, 2001); and the Information Processing Model (Oppenheimer & Kelso, 2015). Nursing educators have found each of these paradigms to be useful in preparing students to become professional nurses. The National Council of State Boards of Nursing (NCSBN) has developed a framework for defining and assessing clinical judgment that is flexible and encompasses all three of the leading theoretical frameworks used by nurse educators when teaching clinical judgment in prelicensure and continuing education programs. This article presents a framework of clinical judgment for use by educators and NCSBN when developing formative and summative performance and licensure evaluations and assessments. Such an integrated framework promotes the potential for congruence between educational and licensure evaluations while enhancing the fidelity and validity of nurses' classroom, clinical, and regulatory evaluation and assessment experience. The first step in constructing a framework for clinical judgment involved building a conceptual model. Because clinical judgment is a higher-order cognitive construct, the NCSBN-Clinical Judgment Model (NCSBN-CJM) had to synthesize cognitive theories of the construct from the literature, facilitate an understanding of the construct, and lay theoretical grounds for defining and assessing clinical judgment (Dickison et al., 2016). Nurses with the skills to recognize, analyze, hypothesize, respond, and evaluate appropriately should be able to deliver excellent care within a multitude of contexts since they are more likely to make good clinical judgments (Dickison et al., 2016). The NCSBN-CJM (Figure 1) is a multilayered model that includes observation (Layer 0), cognitive operations (Layers 1–3), and contextual factors (Layer 4) (Dickison et al., 2016). Layer 0 contains two naturally observable entities: client needs that initiate the process of clinical judgment and clinical decisions to complete the process. Layers 1–3 (the cognitive layers) depict the analysis of an iterative or recursive series of cognitive operations. Layer 1 is a single entity that comprises the entirety of clinical judgment, which is defined by the observable entities depicted in Layer 0 and the unobservable cognitive operations depicted in Layers 2–3. Layer 2 represents an iterative process of three cognitive operations: form hypotheses, refine hypotheses, and evaluate hypotheses. Layer 3 divides these operations into independent, recursive operations necessary for completion of each Layer 2 operation. For example, recognize cues and analyze cues (Layer 3) are necessary to form hypotheses (Layer 2). Layer 4 (the context layer) contains a set of contextual factors that may impact the performance of the cognitive operations within the model. There are two types of contextual factors: individual factors and environmental factors. The National Council of State Boards of Nursing-Clinical Judgment Model. Examples of individual factors include knowledge, skills, specialty, candidate characteristics, prior experience, and level of experience. Examples of environmental factors include physical environment, client observation, resources, medical records, consequences and risks, time pressure, task complexity, and cultural consideration. These factors (individual and environmental) are not critical to interpretation of the scores obtained from objective scoring models but are essential to the development of assessments because they ensure that contextual fidelity is considered in any assessment of clinical judgment. Although Layer 4 should be modified as the scope of nursing practice changes or emerging research suggests additional individual and environmental factors, the scoring model remains intact (Dickison et al., 2016). The value of this layered model is that it affords assessment developers and users great flexibility in determining the level of measurement based on the purpose of the assessment. For example, the assessment developer and user may decide to only focus on Layer 1 to make an overall pass/fail decision, which is common in high-stakes licensure examinations. Conversely, educators may decide to focus on Layer 3 for formative assessment during a student's matriculation through a module of instruction for finer levels of diagnostic information but use Layer 2 for summative examinations to confirm attainment of educational goals and objectives. Nursing educators have adopted a variety of educational frameworks to enhance student acquisition of clinical reasoning skills. The development of foundational knowledge, skills, and abilities needed by nurses to independently evaluate complex information and situations to make appropriate clinical decisions requires prelicensure programs to incorporate a decision-making framework into their curricula (Smith, Thurkettle, & Dela Cruz, 2004; Thompson, Dowding, & McCaughan, 2004). Nursing education in the United States uses three major teaching-learning frameworks for presenting the decision-making concepts to prelicensure nursing students: Intuitive-Humanistic Model, Dual Process Reasoning Theory, and Information-Processing Model. These models provide frameworks that permit the identification of subcomponents of the overall decision-making process, thus allowing educators to plan educational activities and subsequent classroom assessment on the mastery of these subcomponents. It should be acknowledged that the nursing process originally was synonymous with clinical judgment and reasoning, and included five components of problem solving: assessment, nursing diagnosis, planning, implementation, and evaluation. As the nursing process gained acceptance in the profession, nurses noted that although it was a useful tool for beginning students as a foundation for solving client problems, the model failed to encompass the complexities of clinical reasoning and the factors that influence it (Tanner, 2006). Hence, it was not included as a leading model in this article. Intuitive-Humanistic Model. Benner (1984) introduced the theory whereby the nurse moves from novice to expert through experiential growth in knowledge and skills. Thompson (1999) identified this theory as one of the best examples of the Intuitive-Humanistic Model. Benner noted that nursing practice had increased in both complexity (acuity levels of clients, decreased length of hospital stays) and responsibility (career development, differences between novice and experienced nurses), and realized that the exigencies of clinical practice cannot be defined by theory alone. As a result, Benner used the Dreyfus Model of Skill Acquisition (DMSA), which states that the nurses transitions through five levels of proficiency: novice, advanced beginner, competent, proficient, and expert (Benner, 1984; Dreyfus & Dreyfus, 1987). Benner incorporated these five stages of skill acquisition into her definition of nursing clinical judgment. Tanner (2006), in developing the Model of Clinical Judgment, recognized intuitive-humanistic as one type of reasoning that nurses use in addition to analytic and narrative reasoning, acknowledging that nurses go back and forth among these types of reasoning. Tanner explained that less experienced nurses, including students, may rely more heavily on analytic reasoning, whereas experienced nurses are more likely to use intuitive reasoning based on their clinical experiences. Lasater's (2007) research expanded Tanner's aspects of clinical judgment, based on experienced nurses, to describe a trajectory of clinical judgment development for students. Tanner recognized that nurses' backgrounds, both clinical and personal, impact what they notice about patients. An example of this is when an expert nurse accurately anticipates the needs of a client based on his or her previous experiences. In the NCSBN-CJM, Layers 2, 3, and 4 support and explain these underlying cognitive processes for nursing clinical judgment and are complementary to Benner and Tanner in that nursing is composed of both theoretical knowledge and practical experiences. Nurses require deep knowledge to make decisions that result in optimal client outcomes (Benner, Tanner, & Chesla, 2009). As nursing students move on the continuum from novice to greater expertise in practice, their ability to recognize and analyze cues, prioritize hypotheses, and generate solutions for clients, based in evidence and experiences with clients, increases. Their concrete experiences in clinical practice serve to guide their actions and improve their clinical judgment. Dual Process Reasoning Theory. This theory arose from Hammond's cognitive continuum theory (1978) that defined clinical judgment as an adaptive strategy that lies between analytic thinking and intuitive thinking, depending on the context. The cognitive continuum theory suggested nursing actions that require decision making can be viewed on a continuum ranging from intuitive thought to analytical thought, based on the features of the action (complexity, ambiguity, and presentation) that influence the thinking processes of the nurse. More recently, studies have identified and discussed the Dual Process Reasoning Theory of clinical reasoning. Two types of reasoning are discretely identified, nonanalytical reasoning (e.g., pattern recognition, gut feelings, experiential) and analytical reasoning (e.g., hypothesis-driven, purposeful) (Croskerry, 2009; Durham, Fowler, & Kennedy, 2014; Pellacia, Tardif, Triby, & Charlin, 2011). According to Croskerry (2009), the former is often quick, more reflexive, and based on past experiences, whereas the latter involves a more deliberate, purposeful type of reasoning, including generating hypotheses and critically thinking about them. Although these are distinct types of reasoning, the underlying idea is that used together, health care practitioners are able to reason more accurately in clinical situations. Croskerry (2009) cautioned against solely relying on one or the other process, which may lead to unfortunate mistakes; rather, he advocated that nonanalytical reasoning and analytical reasoning should be used to cross-check each other to arrive at the most accurate judgments or decisions. Initially, researchers presumed that novices did not use pattern recognition or intuition for reasoning because of their lack of health care experiences; however, Ark, Brooks, and Eva (2007) found that all levels are able to use nonanalytical processes. This supports Tanner's (2006) proposal that the professional or personal background of the nurse influences what the nurse notices about the patient. The NCSBN-CJM complements the Dual Process Reasoning Theory in that it develops a cognitive model within nursing contexts of care (Muntean, 2012). The NCSBN-CJM at Layers 2 and 3 recognizes that although some parts of clinical judgment, such as recognizing and analyzing cues, often occur at the intuitive (or nonanalytical) layer, more complex parts of decisions, such as generating hypotheses and solutions, and evaluating outcomes, may require in-depth knowledge derived from scientific information (analytical). In addition, in Layer 4, the NCSBN-CJM explicitly references the content or external factors that influence clinical judgments. Just as Tanner (2006) emphasized the relationship between what the nurse notices and the context of care, the Dual Process Reasoning Theory, particularly nonanalytical reasoning, acknowledges the importance of context (i.e., client and environmental factors, and characteristics of the nurse him- or herself) to a nurse's clinical decision-making ability (Croskerry, 2009). Information-Processing Model. Oppenheimer and Kelso (2015) posit that across professions, decision making should be modeled from “basic cognitive building blocks” including memory, attention, and causal reasoning and that decision systems are best understood by developing models of how decision-relevant information is sampled, retrieved, and integrated. This position implies that nursing clinical judgment is highly correlated with general cognition. Dickison et al. 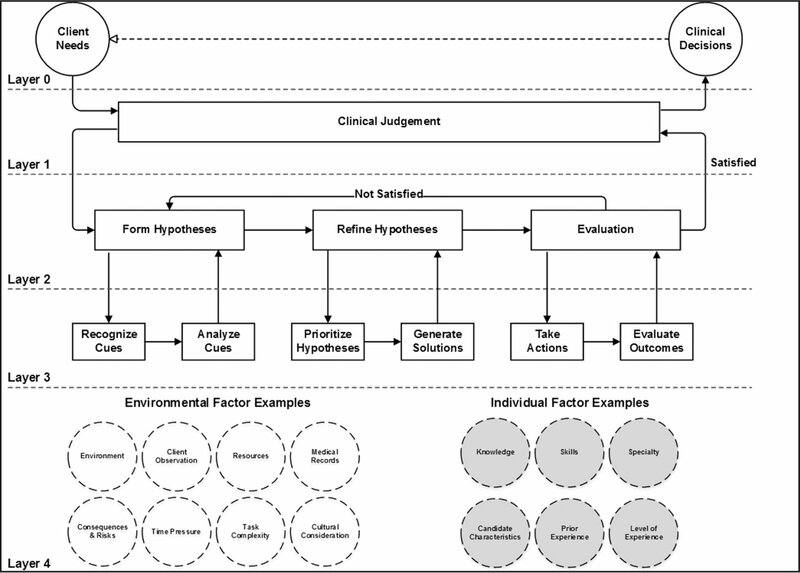 (2016) used the Information-Processing framework to propose a nursing clinical judgment model with five iterative processes: recognize cues, generate hypotheses, judge hypotheses, take action, and evaluate outcomes. This model allows for identification of the process and identification of points of error. Clinicians must use prerequisite knowledge and skills to guide them when organizing information, and because of this, NCSBN focused on decision making situated within context-specific conditions. The construct of decision making is universal in that decisions are made in all types of professions: health care providers (Botti & Reeve, 2003), auditors (Libby, 1985), mechanics (Mehle, 1982), and scientists (Fischhoff, 1977). However, each discipline needs to specify how to implement a decision-making model. Although decision making is common to all professions, each profession requires deep knowledge and must focus on the decision-making aspects most relevant to their profession. Describing clinical judgment by using an information-processing model allows for specification of the mental components involved in decision making and the interactions between them. The first assumption in the NCSBN-CJM is that the world is represented as a set of events that can be observed, such as client needs and responses to those needs or to clinical decisions. NCSBN further developed the model (Figure 1) to describe the underlying cognitive processes that nurses use when entering a situation that requires a decision (Muntean, 2012). Clinicians must first recognize and analyze the cues associated with the clinical problem. Hypotheses are activated and generated based on the cue inputs. After hypotheses are prioritized, nurses will attempt to resolve the current problem by taking action based on the leading hypothesis. In the simplest case, a hypothesis will be associated with a single action; when it is judged as most likely, only one outcome naturally follows. One example would be the need to assess a diabetic client's blood glucose if the client complained of lightheadedness. 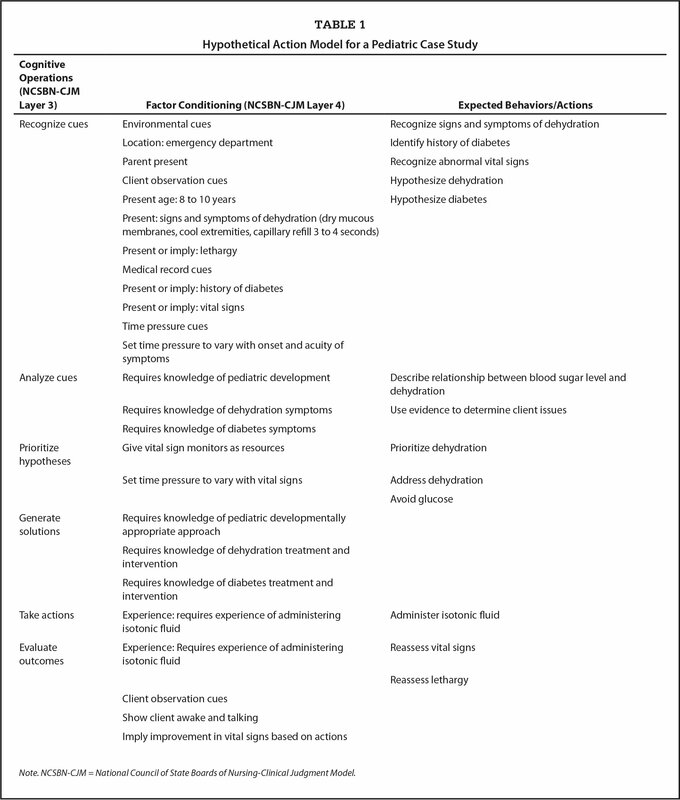 An example of how nurse educators can use the NCSBN-CJM to construct effective assessments of clinical judgment is shown in Table 1, which provides a hypothetical action model for a pediatric setting. Such a model can be used to assess whether students are able to make an appropriate nursing clinical judgment within a given scenario by following the cognitive operation steps through an entire case study or choosing one or more of them to target for assessment purposes. The cognitive operations in the first column in the Table 1 represent necessary operations described in Layer 3 of the NCSBN-CJM. The column for factor conditioning describes the context (Layer 4 of the NCSBN-CJM) that directs the content of students' assessment. This context can be used to write multiple-choice test items or to develop case-study or simulation activities designed to elicit the observable outcomes or behaviors. Finally, the column for expected behavior/actions describes appropriate student actions, or observable outcomes, that can be measured. As this example shows, the NCSBN-CJM can help nurse educators and producers of nursing educational materials design effective tools for assessing clinical judgment by helping them target specific cognitive operations (e.g., analyzing cues to generate observable actions that reflect students' clinical judgment abilities). These assessments also can be used to determine where the process was strengthened or broken down. The layered design of the model (Figure 1) allows educators to determine whether student errors are related to cognitive operations (Layers 1–3) or contextual factors (Layer 4). After the focus of the students' errors have been identified, educators can use the action model to guide focused evaluation and remediation plans (individualized or group) on the specific areas of the of the NCSBN-CJM (Layer 3). In more complicated scenarios, however, a hypothesis may be associated with several reasonable actions. In these situations, nurses activate and generate a set of reasonable actions and then rank them. Thus, much like hypothesis generation and refining hypothesis, the same underlying mental processes occur for generating and ranking a set of reasonable actions. It is important to note that a nonaction, such as waiting and collecting more information (e.g., hypothesis guided search) (Thomas, Dougherty, Sprenger, & Harbison, 2008), is itself a decision. From an assessment perspective, the NCSBN-CJM offers measurement of several components of decision making, allowing nurses to fail at particular stages and engage in several mental iterations before reaching an appropriate outcome. Failure where client care is concerned is unacceptable. Thus, although the outcome might be the same between two decision makers, one might have a more efficient process, yielding better client outcomes. Nurses make clinical judgments that combine their context-sensitive deep knowledge with their decision-making experience as an integral part of their work. Describing decision making as a process provides a granular method for assessing a nurse's decision-making ability by measuring the nurse's actions at multiple points identified by the subcomponents of the assessment model or teaching-learning framework. Temporal dynamics can complicate clinical judgments and make their assessment challenging. Regardless of the model or framework, an essential component unique to clinical judgment is the evaluation of a decision to act or not act on what has been noticed (Tanner, 2006). Nurses cannot correctly resolve an issue until this has occurred. Complicating matters, the timing of evaluation varies with the client issue and presentation. On some occasions, observable outcomes occur during or immediately after an action (reflection-in-action [Schön, 1987]), but on other occasions, delayed observable effects require a nurse to revisit the decision later (reflection-on-action [Schön, 1987]). However, after nurses have evaluated the outcomes and produced desirable effects, they can successfully end the action. Generating meaningful data about nursing students' ability to make appropriate clinical judgments remains a challenge for nurse educators. Using previous models of clinical judgment, multiple-choice examinations often failed to capture the complexity of the clinical judgment process, and observation-based evaluations of client care performance in the clinical or simulation setting lacked the structure to elicit observable evidence of the invisible decision-making process. By combining the integrated NCSBN-CJM (Figure 1), the action model (Table 1), and a variety of assessment techniques (class discourse, clinical simulations, scenario-based testing, and computer gaming technologies), nurse educators and producers of nurse educational materials that have greater financial resources than nursing programs can design assessments to elicit measurable outcomes or responses that reflect examinees' clinical judgments, clearing the way for more authentic evaluation. For example, using the action model to develop a fidelity-based clinical simulation would allow educators to use the NCSBN-CJM to assess nurses' ability to effectively apply clinical judgment as defined by the action model at the observation, construct, and context levels. This application of the NCSBN-CJM allows for student feedback at a more finite and useful level for the formative development of future nurses. Following this same example, the producers of nursing educational materials could develop avatar-based computer simulations and other technologically advanced items that could further enhance the fidelity of the assessment and provide focused feedback to learners. Application of this model will help establish a more robust evidence base for academic and licensure examination processes. The ability to assess higher-level thinking is critical to the advancement of evaluation in nursing and health care education practice. The educational framework proposed by NCSBN is a credible framework that provides a converging perspective inclusive of the concepts defined in the three leading paradigms for assessing clinical judgment. The NCSBN-CJM is a flexible model that expresses the complexities associated with decision making in a simplified manner to enable better assessment of clinical judgment. Benner, P. (1984). From novice to expert: Excellence and power in clinical nursing practice. Reading, MA: Addison-Wesley. Dickison, P., Lou, X., Kim, D., Woo, A., Muntean, W. & Bergstrom, B. (2016). Assessing higher-order cognitive constructs by using an information-processing framework. Journal of Applied Testing Technology, 17, 1–19. Dreyfus, H.L. & Dreyfus, S.E. (1987). Mind over machine: The power of human intuition and expertise in the era of the computer. New York, NY: The Free Press. Fischhoff, B. (1977). Perceived informativeness of facts. Journal of Experimental Psychology: Human Perception and Performance, 3, 349–358. Hammond, K.R. (1978). Towards increasing competence of thought in public policy formation. In Hammond, K.R. (Ed. ), Judgement and decision in public policy formation (pp. 11–32). Boulder, CO: Westview Press. Lasater, K. (2007). Clinical judgment development: Using simulation to create an assessment rubric. Journal of Nursing Education, 46, 496–503. Tanner, C.A. (2006). Thinking like a nurse: A research-based model of clinical judgment. Journal of Nursing Education, 45, 204–211. Thompson, C., Dowding, D. & McCaughan, D. (2004). Strategies for avoiding pitfalls in clinical decision-making. Nursing Times, 100, 40–42. Dr. Dickison is Chief Officer, Operations and Examinations, National Council of State Boards of Nursing, Chicago, Illinois; Dr. Haerling is Associate Professor, Nursing and Healthcare Leadership, University of Washington Tacoma, Tacoma, Washington; and Dr. Lasater is Professor (Retired), Oregon Health and Science University, Portland, Oregon. Address correspondence to Philip Dickison, PhD, RN, Chief Officer, Operations and Examinations, National Council of State Boards of Nursing, 111 E. Wacker Dr., Ste. 2900, Chicago, IL 60601; e-mail: pdickison@ncsbn.org.